Thank you very much LN Fitness, they have an incredibly helping team of tutors that brought me closer to achieve one of my big goals, to be a personal trainer! I would especially like to thank Temi for the amazing support. Excellent experience, I can’t wait to do more courses with LN Fitness, I will come back for Level 3 soon. 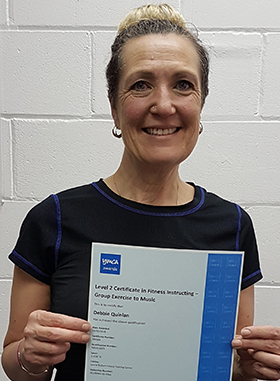 I would like to thank LN Fitness, for the skills and knowledge they imparted to me and helped me, for all the support and positive encouragement in achieving my Level 2 “Exercise to Music” course and passing it. They are amazing, extremely knowledgeable and always had the time to help me in any way I needed. I have enjoyed this course very much. I definitely recommend LN Fitness and I will certainly be back to take the “water-Based Exercise” course soon. Thanks LN! I completed my Instructors Group Indoor Cycling course. I would like to thank the team at LN Fitness Training Centre as they were brilliant and very supportive and always had the time to help in any way I needed. I would recommend LN Fitness to anyone who wanted to get into the fitness industry. 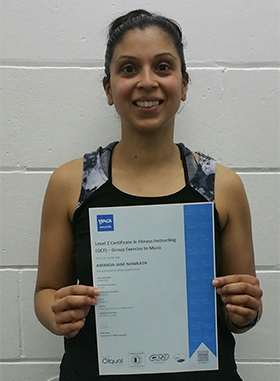 I completed my Level 2 Gym Instructor course after not studying for a long time. 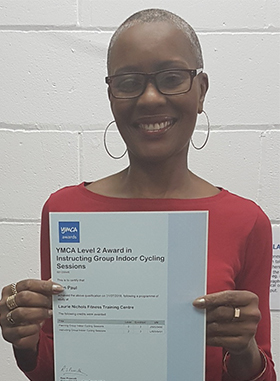 I thought I would not be able to pass this course when I started, but thanks to the staff and support I got, I did and it has made me confident to go on and do my group Indoor cycling course and even my level 3 PT. 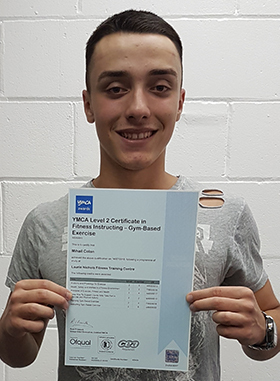 I would like to thank Laurie and the tutor Des for taking time to help me build confidence so I can go on and get a career in the fitness industry. 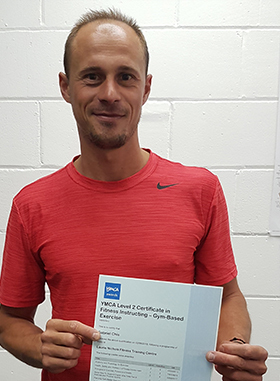 A lot of thanks for LN Fitness for helping me to achieve level 2 gym instructor, and I want to say thank you to everyone all the staff, they’re amazing. The tutors are 10/10 they help you to remember a lot of things very easy with their tricks, and I really appreciate the patience they had with me (because I got only 2 years in UK and my english isn’t that good), and they’re really doing a good job there, I hope I’ll come back for level 3. 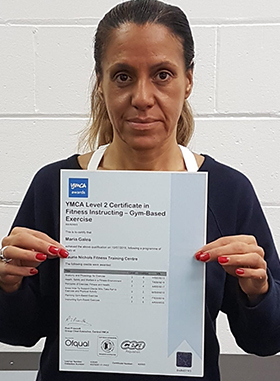 Also a few weeks after I got the qualification I started work in one of active Newham gyms and is amazing to have interactions with people from fitness industry. BIG THANKS AGAIN FOR LN FITNESS AND THE WHOLE STAFF/ TUTORS, I’ll recommend this company for everyone, hope I’ll see you soon, thank you! 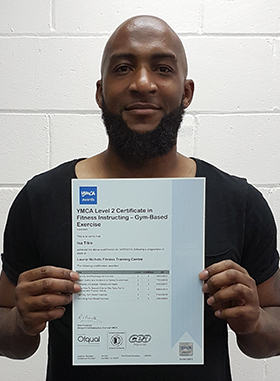 I would like to thank the team at LN Fitness Training Centre for supporting me throughout my training to complete my level 2 Gym Instructor course and level 3 Personal Training qualification. 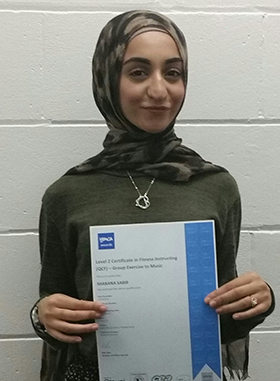 The teaching resources made my learning experience enjoyable as the content was engaging and when submitting assignments, I was given constructive feedback shortly afterwards. When looking to gain future qualifications, LN Fitness Training Centre will be my first choice. I have been working in the fitness industry and NHS for 20 years, which prompted me to take this course. 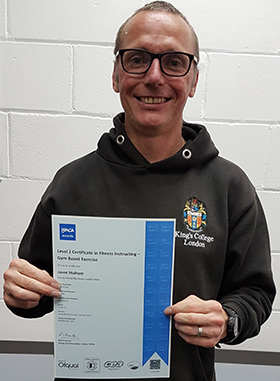 I would like to thank LN Fitness, Laurie Small and Ian Power for all the support and positive encouragement in achieving my level 3 Diploma in Exercise Referral as I would like to help all communities to work together and achieve good health. I was eager to take the Group Indoor Cycling course as I so much enjoy taking part in the classes and decided to take the next step. Now I'm so happy to be a qualified Group Indoor Cycling Instructor. The tuition lived up to my expectations as the Tutor was professional in the teaching. Thank You. I have enjoyed this Exercise to Music course very much. Wonderful team mates and going back to a pencil and note pad, school life was refreshing. It was a hands-on course which I liked. Flexible, especially as I joined 3 weeks into the course. 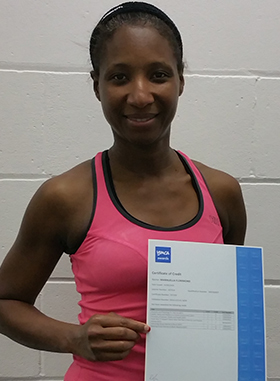 I would like to thank LN Fitness for all their help and support doing my level 2 gym instructor course and passing it. I would recommend LN Fitness to anyone who wanted to get into the fitness industry, as they are very helpful, patient, and professional, I look forward to working with LN Fitness again when I start the next part of my journey, the personal trainer course. 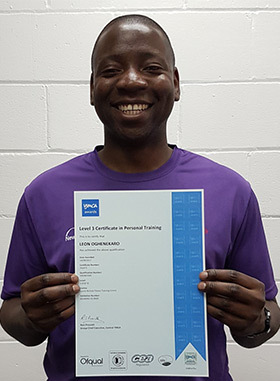 I have recently completed both the Level 2 Gym instructor and Level 3 Exercise Referral courses with LN Fitness and it has been an amazing experience. I found LN Fitness to be very professional and would recommend them to anyone interested in becoming a fitness professional, wishing to increase their knowledge in regards to Anatomy and physiology which will give you a great insight into how the body works and responds to exercise. LN Fitness has given me a strong foundation to expand upon and has given me valuable tools that will help guarantee my success in the future within the fitness industry. Excellent experience, can’t wait to do more courses with LN Fitness. 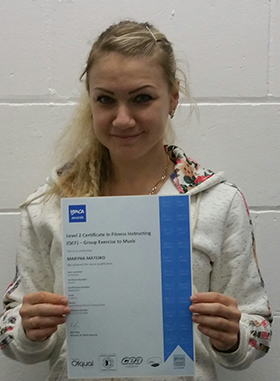 Huge thanks to LN fitness for getting me through Level 2 Gym Instructor and Level 3 Personal Trainer courses. An incredibly helping and lovable team of tutors just brought me closer to achieve one of my big life goals, to be a personal trainer! I will put in good use all I've learned and start giving capoeira classes and fitness training. I’ve always wanted to do something in fitness and back in 2017 after taking redundancy I thought why not be an instructor. I love dance, I love group exercise so why not learn to teach it. The course was intense and the theory was a shock to my system seeing as I haven’t studied for over 15 years. The tutors were great and made it fun and non-taxing. The LN Fitness team have been a great support. A special thanks to Waine and Debbie for putting up with my questions. I surprised myself and proud that I have passed the course. It has been a real-life confidence boost. 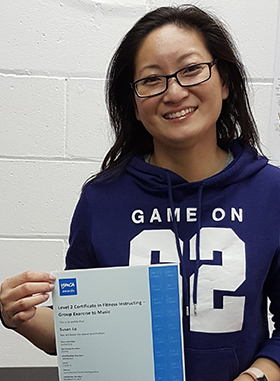 Studying at LN Fitness Training Centre has transformed my life, not only have I been able to successfully change my career but I have also been able to fulfil my long-term goal of helping people change their lives through sport participation. 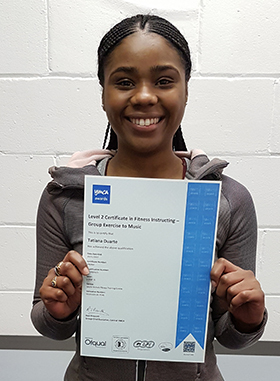 The consistent help, support, advice, guidance and encouragement whilst on the Level 3 Personal Training course at LN Fitness Training Centre was phenomenal. I cannot thank Laurie and all the LN Fitness team enough, for the skills and knowledge they imparted and helped me develop. The continuous professional development opportunities that LN Fitness Training Centre provide, have meant that I can continually progress as a Health and Fitness professional and stay in touch with a fantastic team. Laurie and the LN Fitness team went above and beyond for me. I would recommend LN Fitness Training Centre to anyone who wishes to gain expertise in the Health and Fitness industry. My name is Debbie, I have always had a passion for dance and the gym. Following redundancy, I decided to embark on a L2 Exercise to Music Course. 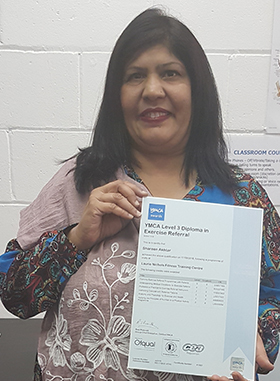 I didn’t expect to pass the course but was given encouragement throughout the course by my tutors and the other participants on the course. The friendly atmosphere made it fun and the weeks passed very quickly. 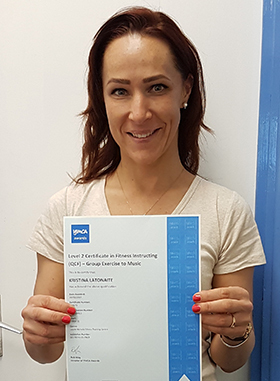 I gained valuable experience, made some good friends, and would definitely recommend LN Fitness to anyone who would like to gain a fitness qualification which is recognised internationally by the fitness industry. I chose this course due to my interest in fitness, my parents being ex athletes. I would like to say a massive thank you, to the LN Fitness team for the opportunity to do the course. The tutors were amazing giving you their knowledge learnt over the years, supporting you through your journey and being on hand to answer any questions, they were always ready to help no matter what. I definitely recommend LN Fitness to anyone embarking on a fitness career. The gym instructor course I signed up for gave me all the knowledge and guidance I needed. The tutors were very helpful and took time to help us understand all that we needed to know. I enjoyed every minute of this course and the support we had was so beneficial. It was the best place to learn in as I felt comfortable enough to ask questions when I was confused or unsure. Classes were always structured well and our resources were more than helpful. Now as a fitness instructor, this has been the foundation for my future development in the fitness industry and I would definitely recommend LN Fitness to all those looking for quality fitness courses. 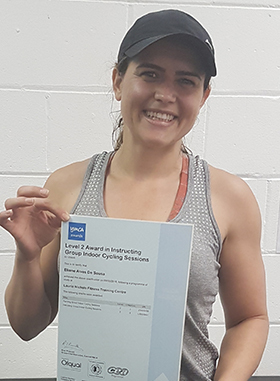 I just completed the Level 2 Exercise to Music Course with LN Fitness and I am very happy with the knowledge I gained. The teachers are very supportive and can answer any questions! I would highly recommend the course with them! 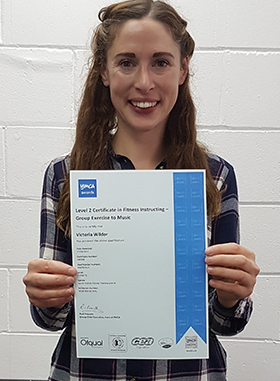 I have completed and passed the Level 2 Exercise to Music course. 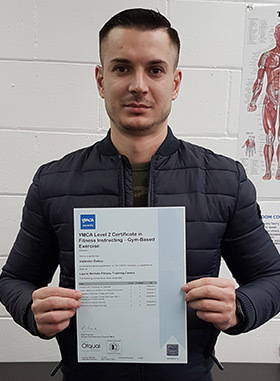 Hi, my name is Jason and I have completed my level 2 Fitness instructor (gym based) course, and my level 3 in Personal Training with LN Fitness. Being in my mid-forties, and not having done any type of schooling or study since high school made me feel very nervous and apprehensive about beginning and completing these courses, but my worries were quickly put to rest. Laurie and the team at LN Fitness are extremely knowledgeable, friendly, very supportive and always have the time to help in any way I needed. In addition to the above courses I also just completed a level 3 Emergency First Aid course with LN Fitness. This was a fun and informative day and I enjoyed every minute of it. I highly recommend LN Fitness to anyone interested in or wishing to work in the field of fitness instructing. 10 out of 10 LN Fitness, Thank you. Massive thank you to Laurie, Debbie, Davina, Waine and Natalie for the invaluable support, encouragement and knowledge provided throughout the course - such a fantastic team of tutors! Although the theory can be a lot to take in, the course content is broken down into really easy digestible sections, taught in a way that suits every learner. Additional support is always provided which really helped me to feel confident in my understanding. I thoroughly enjoyed learning from my tutors. 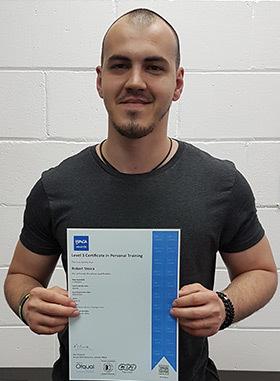 The Level 2 Exercise to Music course has given me such a boost of confidence, motivation and enthusiasm to begin to carve out a new direction in my career and I cannot thank the team at LN Fitness enough! Will certainly be back to take Step and Boxing CPDs in the near future! After being made redundant from my sales job of 15 years, I took the big step of deciding to train in something that I enjoy and am passionate about… fitness. 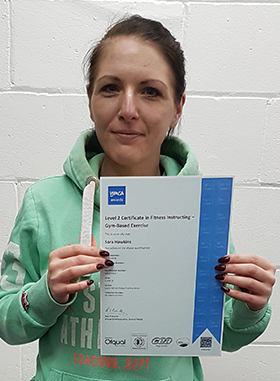 I enrolled on to the L2 Gym Instructor Course and passed in December 2017. 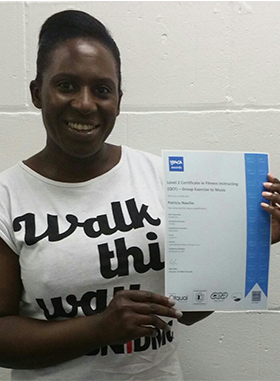 The team at LN Fitness were professional, extremely knowledgeable and made the course interesting and fun. 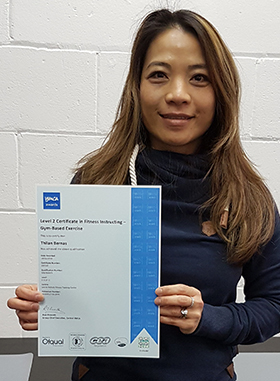 So much so, that I decided to further my training in delivering fitness instruction and am now coming to the end of my L3 Personal Training Course. I cant wait to continue my journey in developing my skills and learning as much as I can about what it means to be a really good fitness instructor! Dancing was always something I wanted to do and thanks to LN Fitness I have achieved my life long dream and passed the Exercise to Music and the theory modules. 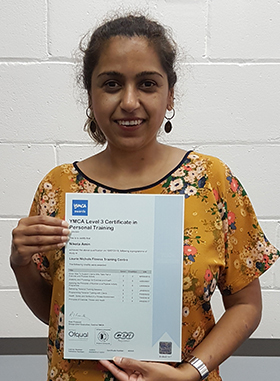 The theory was challenging as I haven’t studied for over 10 years but the modules and subjects were broken into sizeable chunks and delivered by knowledgeable and experienced tutors. 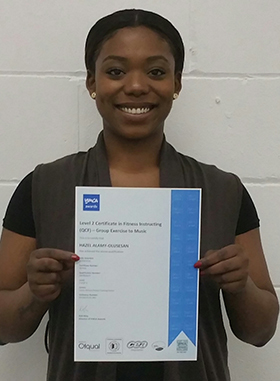 So now I can teach in sport centres, gyms and schools where the ETM qualification is a necessity. I have always enjoyed doing the classes at the gym, so when I saw the LN fitness courses available I thought why not do Exercise to Music, so I did. Laurie and all the team gave lots of support throughout the course and have always trusted I would pass, which gave me motivation and encouragement. I have always been interested in fitness since I was a child. Last year I decided to do a Level 2 Fitness Instructor Course with LN Fitness and I have gained so much knowledge in fitness since doing this course. I would like to use this opportunity to thank the LN Fitness team. You all have been amazing! Having been in fitness for many years it came to a point where I thought I can make good use of this and that's when I turned towards LN Fitness. It was a no brainer! LN Fitness is the best training centre with knowledgeable and the most humble tutors around. I would like to say a massive thanks to Laurie, Andrea, Kem, Annie and Seun who passed on their knowledge onto us, it was an amazing experience and got me prepared for life within the fitness industry. During the course I gained valuable informative knowledge as well as friends who I still keep in contact with to this day. No matter where I am I know Laurie and the team will be on hand to support me without any hesitation. I would like to thank the LN team once again for all the work they've put in to get us prepared and I'm looking forward to taking my learning further with LN Fitness. I love group exercise classes and moving to music and I wanted to do the course to help others enjoy exercise as I do. Hopefully I can help people feel happy and improve there health with my classes. The course took my passion for exercise and allowed me to explore this in detail, both practically and through theory which really changed the way I thought about exercise and health for the better. The team at LN Fitness were fantastic and helped me so much. 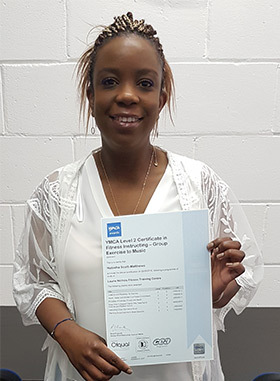 The tutors were always able to help and explain parts of the course and had so much patience and time for you.The course was very intense, but was very well organised and broken into chunks which made it achievable and I found it so much fun.I am so pleased I enrolled in the course and can't wait to teach classes and to further my training. Thank you everyone at LN Fitness. Wow where do I start? Anyone who loves fitness and dance should do this course. All the LN Fitness instructors and tutors were so helpful going above and beyond in and out of class time to make me feel prepared for the exams. I only passed a few weeks ago and I have already successfully got work as an ETM instructor because of the course. Not to mention because the course is in association with the YMCA it’s automatically recognised by industry employers. I can literally teach anywhere including internationally. Thanks LN! I want to thank all the LN fitness team for the great effort and jaw dropping knowledge in Fitness and health that every tutor has. It was a great experience achieving my qualification in Exercises to Music with them. The staff it's very friendly, helpful and they make everything easier. I highly recommend LN fitness to anyone that has a passion for health and fitness and wants to grow in the Industry. Hi my name is Nicola, I have worked in the fitness industry for approximately 30 years. 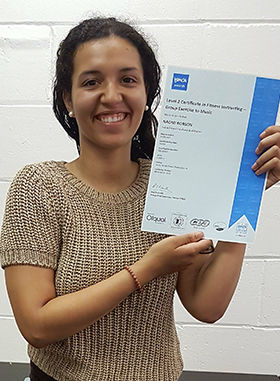 I came to LN Fitness to explore the possibilities of furthering my career and give me an insight into tutoring. 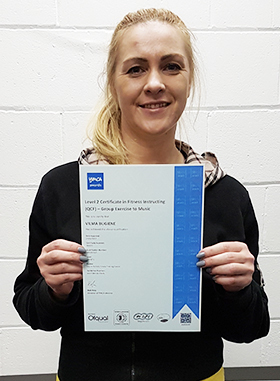 The Level 3 Award in Education and Training course did just that and I highly recommend this course and Laurie herself! 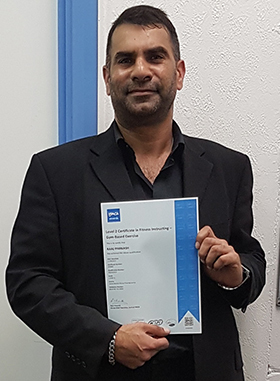 It was professional enjoyable and I have already booked my next course, which is the Assessors course. I was going through a tough time, that life at times throws at you! I met Laurie, Temi, James, Kem and Annie, the LN Fitness team and made the decision to change things! The LN Fitness team not only helped me gain a qualification, they also helped me turn my personal life around. Doing this course with LN Fitness teams support, taught me life lessons as well as gym physical and mental growth. I am grateful to the team, they also supported me after the course had finished. Truly amazing and can’t thank this team enough. 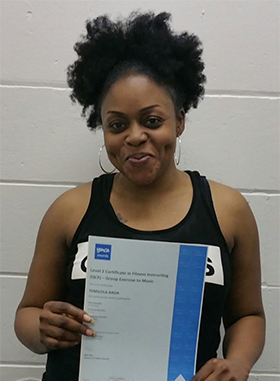 Since completing the course, I have now been given the opportunity to work with Active Newham. I having been in health and fitness all my life. I graduated the university of Sports, finished Fitness instructor Level 2 and Pilates courses. I was dancer, so I decided to complete Fitness exercise with music courses in LN FITNESS TRAINING CENTRE. I recommend the following courses for people who in hurry and do not have any time. Flexible schedule for them may even end up working full time. I like how teachers import knowledge, can understand even if English is not your native language. 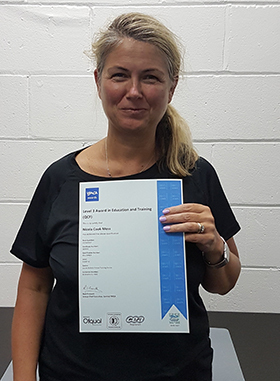 Thank you to all the teachers and specially Laurie, whose support and knowledge helped to complete of these course. I want to say a big thank you to the trainers at LN Fitness as they were brilliant and very supportive throughout the course. Amazing experience, very professional and would definitely recommend to any of my friends who would like to become fitness instructors, personal trainers or even to those who have a passion for sports and want to find out more details about the body and how to train properly. Brilliant experience, can’t wait to do more courses with LN Fitness. Having been into health and fitness for over 10 years I felt it was time to specialise in what I enjoyed doing. 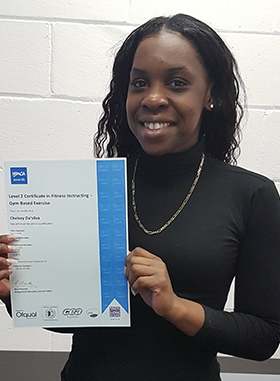 LN Fitness gave me the opportunity to get my qualification in a very friendly and inspiring atmosphere, it was very affordable and the structure is designed to suit the varied needs of different learners. I had a lot of support and encouragement from the tutors right up to the day of the assessment and beyond! We were giving a lot of material and plenty of fun and detailed workshops. 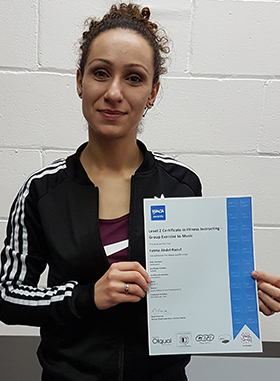 For anyone looking to gain a qualification in Exercise to Music (ETM), with experienced, innovative and practical teaching, LN Fitness is definitely the place to go! Thank you Laurie and her team! 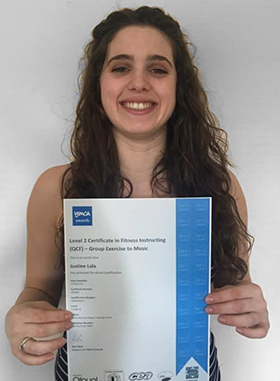 When the opportunity arose to undertake the Exercise to Music Instructor course, it was an easy decision as I know Laurie very well through attending her excellent classes at the gym. The fact that everyone was 'close' on the course meant that we all 'pulled together' to support and help each other succeed. Even though LN Fitness has only just started running the course, they are professional and the instructors very competent. 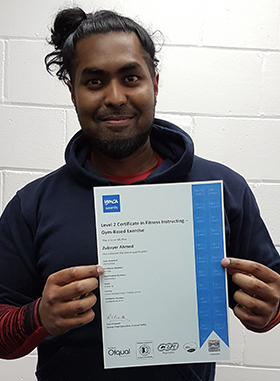 It has certainly provided me with a fantastic, exciting new skill which I plan to make full use of as soon as possible. Love the course and could not believe how quick it went. The instructors were very good at delivering each lesson. They done a great job, because English is not my first language but I understood quite easy. There was a good mixture of both theory and practical work which meant no single day was the same and we got to have a lot of fun too. 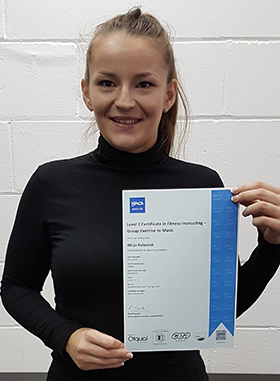 During the course, I gained valuable experience, made friendships, improved my self confidence and still continue to get support from Laurie. I would like to thank you the tutors for all their hard work they put in over the weeks. I am looking forward to do another course with LN fitness training centre and highly recommend it. 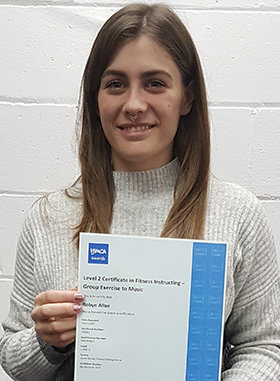 There is so much more you can achieve when studying not just a certificate, you make new friends, gain knowledge, experience different things and for me the best part, I realised what I want to achieve. I recommended this course to anyone whether you have experience or not. This course is great for everybody, who aspires to work in the fitness industry.If you are considering this course, don’t think, just do it …otherwise later on you may regret. I have been a dance teacher for coming up to 10 years now and really enjoy working out. I was interested in gaining my ETM and after searching around I decided to do it with LN Fitness. This has been one of the best things I’ve ever done as I learnt so much. I’ve now passed my ETM and began teaching 2 weeks after. Laurie is a great teacher and role model in the fitness industry. Thank you LN Fitness, thank you Laurie. 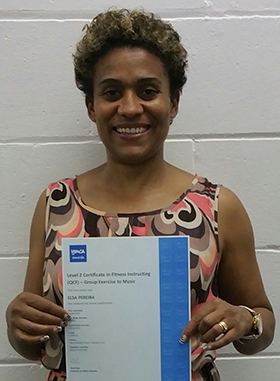 Are you thinking about doing an exercise or fitness accredited qualification? I definitely can recommend LN Fitness as they are a first class training provider. 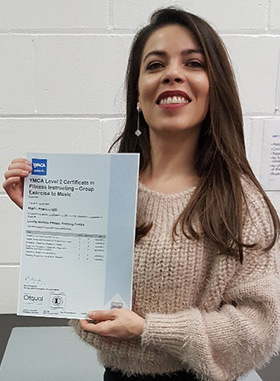 With an enthusiastic and knowledgeable team of tutors, I was offered first class teaching from LN herself and her colleagues whose dedicated individualised approach worked as I'm now a qualified Exercise to Music Instructor! 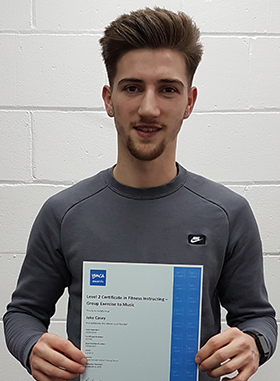 Completing the Exercise to Music course has given me newly acquired knowledge and skills that I'll be able to use within the industry. Thank you LN Fitness for your belief in me! Dancing and exercise has always been a great passion of mine since I was young. I’ve always wanted to get myself into the fitness industry and be able to run my own classes with my own little twists of music. ETM fitness course helped me to achieve this through the experienced teachers and the best resources. 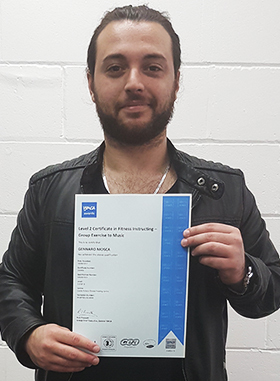 The course was really enjoyable and I had a great opportunity to socialise and meet amazing people. I would definitely recommend this course to everyone as it’s the first step to an amazing career in Fitness. I would like to thank all the tutors for their support and believing in me. All the best to any newcomers. 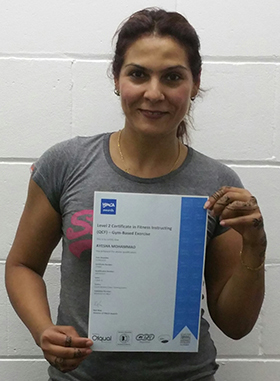 I did this course because fitness was an industry which I wanted to further venture into. This is because it was and still is my passion and hobby and the LN Fitness course was the perfect way of getting knowledge on this, as well as a way to get an introduction into health and fitness related job fields. The people at the LN Fitness Training Centre were very helpful in all ways imaginable and the learning portion was very intriguing. Someone in specific who had encouraged me, and went miles ahead for her customers’ satisfaction is, Laurie. She was a main reason for my recommendation to join the LN Fitness course as it could not be made simpler with her help. I truly recommend to those of you who are interested in Fitness and wishing to be an instructor, to take that step forward with LN Fitness. The tutors are very knowledgeable and deliver a fun and challenging learning structure. 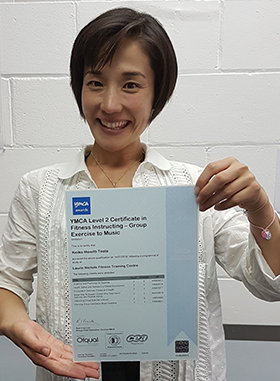 I qualified within the ETM course smoothly due to the endless support and encouragement. Due to the excellent service I received from LN Fitness, I will undergo the step course which will take place very soon. Once again many thanks to LN Fitness Training Centre and the team. Hello my name is Justine, I am from France, I moved to London only 3 months before I began the course. I didn’t expect to pass the course, but thanks to the good knowledge of our teacher I made it. I definitely recommend LN Fitness, its really a good opportunity and accessible for everyone. I really want to thank everyone, it was really a pleasure and a valuable experience to work with this team.